Anxiety in meetings at work can be a problem for those with social anxiety disorder (SAD). Perhaps you have missed out on promotion opportunities because you didn't speak up in meetings like your colleagues. Or, maybe you have avoided promotions completely because they would mean that you would have to attend more meetings. If your anxiety is not severe or you are already in treatment for SAD, there are a number of coping strategies that you can use to help alleviate social anxiety in meetings at work. 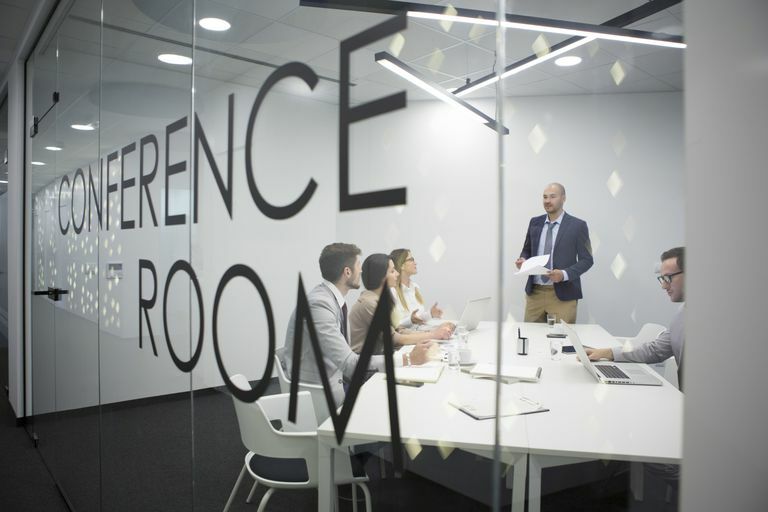 If you are required to present during meetings, or simply wish to improve your skills at speaking to a group, there is no substitute for regular practice. In addition to practicing material on your own, you should consider joining a group like Toastmasters. Talk informally to a group. During the first few sessions, you are free to observe and decide whether or not you want to participate. If Toastmasters isn't an option for you, you can still brush up on your communication skills. Make a point of telling a story in front of friends or asking a question of every guest at the next party you attend. View every social encounter as a chance to practice and become better at communicating. Perhaps you have managed to get through business meetings by being so thoroughly prepared that you have a scripted answer to every question. Although preparation is important, being over-prepared is a subtle type of avoidance. It is just as important to trust yourself to be able to respond spontaneously to questions and discuss issues that aren't pre-planned. Realize that in these situations, it is OK to say that you are unsure about something and that you will look into it. Other avoidance behaviors might include not looking anyone in the eye, covering your mouth when you talk, or simply avoiding speaking at all in a meeting. If you find yourself engaging in avoidance behaviors, give yourself permission to feel some anxiety in meetings. Realize it's not the end of the world if others notice you are nervous, and eventually you will feel more comfortable. If you suffer from social anxiety in meetings, you will probably never be the most eloquent speaker in the group. However, that doesn't mean that you can't gradually improve your speaking skills to the point that you come across as professional and poised. In addition to being a good speaker, being a good listener is a valuable skill in meetings. If this sounds like you, use your listening skills to your advantage. If you listen carefully to what others say and choose your words carefully, others will admire your wisdom and patience. A reasonable amount of preparation will leave you feeling confident and prepared. On the other hand, over-preparing or under-preparing may leave you feeling even more anxious—particularly because these are often a reflection of your anxiety. If you aren't sure how much to prepare, read through the tips below to give you a sense of what is reasonable to think about in advance. Prepare and research issues before a meeting so that you are up to speed. Wear clothing that is comfortable and professional, and that makes you feel good. Talk on the phone with a friend or family member who makes you feel relaxed before a meeting, and then carry that feeling with you into the meeting. Arrive at least 10 minutes early so that you can meet people as they arrive. Visuals are great tools both for getting a message across and drawing attention away from yourself. If you are speaking to the group, use some sort of visual medium as part of your presentation. Not only will this enhance the message you are trying to communicate, but it will take the pressure off of you being alone in the spotlight. If you suffer from severe social anxiety, there is no substitute for treatment such as medication or cognitive-behavioral therapy (CBT). In combination with the tips above, you should be well on your way to successfully managing social anxiety in meetings at work. Carducci BJ. Shyness: A bold new approach. New York: Harper Collins; 2000. Carducci BJ. Pocket guide to making successful small talk: How to talk to anyone anytime, anywhere about anything. New York: Pocket Guide Publications; 1999. Clark CH. The shy writer. Bangor, ME: Booklocker.com; 2004. Henkel SL, Lujanac M. Successful meetings: How to plan, prepare, and execute top-notch business meetings. Ocala, FL: Atlantic Publishing; 2007. Stein MB, Walker JR. Triumph over shyness: Conquering shyness and social anxiety. New York: McGraw-Hill; 2003.